Most of us start in January with the intentions of following; ‘new year, new me’. If this is the approach you are taking, why not adopt the same approach to your farming. This is why we have started Tru-Test Transformation. This is where we would recommend you to weigh your livestock on a regular basis to insure they are reaching weight targets and to assess herd health by running livestock through a crush regularly. It is coming to that time of year again where we are preparing to let animals out on grass. It is a very important time to analyse how your livestock preformed throughout the winter. The best way to measure this is through weighing. Weighing your livestock before they go out to grass can help you identify if you have reached weight targets for the factory or getting heifers ready for the bull. It is vital that heifers are on target at this time of year to make the adequate weight to be bulled. Weighing will take the guess work out of this process and will provide you with accurate results to allow you to know the correct feeding to give. All these animals will also need to be dosed before they are let out to grass. Weighing can take the guess work out of dosing and ensures all animals get the correct dosage. With guessing the weight, animals often get too much or too little dose which is not recommended. 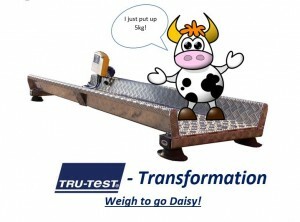 So join our movement today, start your Tru-Test Transformation and be up to date with your herd’s weight and health. For more information on our Tru-Test Range, see our website our call our sales team on 021-7334066 today!